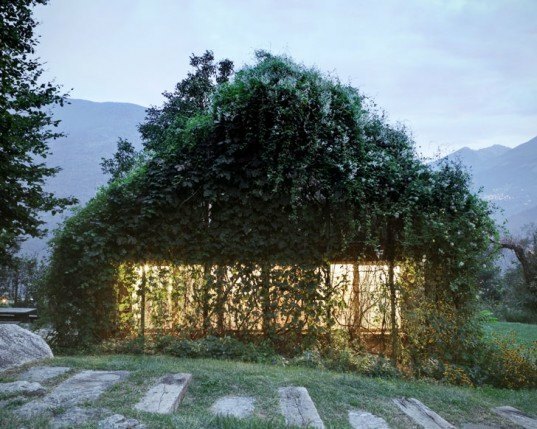 Act_Romegialli has given a small disused garage in the Italian Alps a gorgeous new life by completely wrapping the building with climbing vegetation. Called “Green Box”, the rustic shed in the back of a client’s weekend home now serves as a welcoming studio. 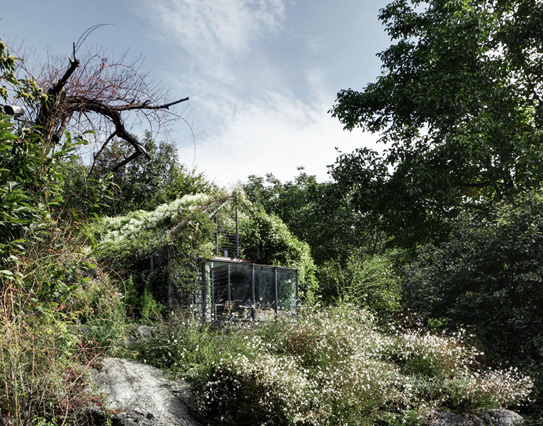 Act_Romegialli installed a lightweight steel frame around the building, enabling an array of plants and vines to grow over the garage, transforming it into a serene and private escape. Rather than renovating the exterior of the garage with paint or siding, Act_Romegialli decided to let nature take its course, extending the idea of a green roof all the way to the ground. Leafy vines and flowering plants now completely cover the steel frame, ensuring a rotating cast of colorful blooms across its façade. The interior of the garage still partially suits its former use, housing gardening tools for manicuring the yard. The large windows that line the walls now have a living privacy shade made of light-filtering vines. 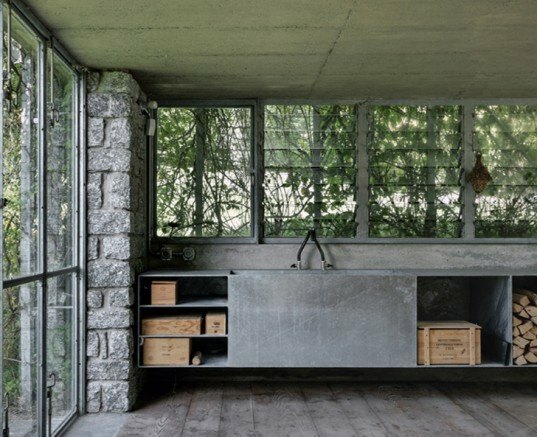 The architects used simple, rustic materials to create a small kitchen for cooking garden-fresh meals. Reclaimed wooden planks line the floor, while large windows open onto the lush property with galvanized steel frames, connecting the inside to out. The transformation has created an idyllic escape on the client’s property that changes color and texture with the passing of the seasons. Green Box is a perfect garden escape for the green-thumbed client. Loved the article and so the pictures, really great green scape, too little furniture though a sofa would have look nice, keep on the good articles! We had a garage where I grew up in Washington that was completely covered in greenery like this one features, but the insurance companies wouldn't allow it because it was 'dangerous.' Pretty sad we had to tear it down. Rather than renovating the exterior of the garage with paint or siding, Act_Romegialli decided to let nature take its course, extending the idea of a green roof all the way to the ground. Leafy vines and flowering plants now completely cover the steel frame, ensuring a rotating cast of colorful blooms across its façade. The interior of the garage still partially suits its former use, housing gardening tools for manicuring the yard. The large windows that line the walls now have a living privacy shade made of light-filtering vines. The architects used simple, rustic materials to create a small kitchen for cooking garden-fresh meals. Reclaimed wooden planks line the floor, while large windows open onto the lush property with galvanized steel frames, connecting the inside to out.